The Salt and Pepper moth Utetheisa pulchelloides, is also known as the Heliotrope Moth. 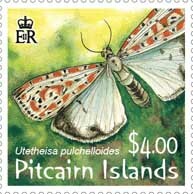 It is found on Henderson Island and grows to have a wingspan of approximately 30mm and a body length of 20mm. The moth looks quite white when it is flying, but at rest, the interesting pattern of red / orange and black spots on the white fore wings can be seen. Each hind wing is white with two black spots and an irregular black margin. The moth is active during the daytime hence the bright colours, which are unusual for a moth. It uses the colours to attract others instead of the usual pheromones emitted at night. It feeds on various plants found throughout the Pacific eg. Octopus Bush Argusia argentea, Salvation Jane / Paterson’s Curse Echium lantagineum, Heliotrope Heliotropium arborescens and Forget-me-Not Myosotis arvensis. It is believed that they do not cause damage to crops. The eggs are pale green and laid in a row on a leaf tip. The insect pupates in a loose cocoon spun in the leaf litter on the ground below the food plant. The caterpillars have sparse grey hairs and are black with orange spots and broken cream lines along the body. Following a degree in scientific illustration, Sue spent nine years as a Botanical Illustrator with the renown Royal Botanic Gardens, Kew. A prestigious Winston Churchill Travelling Fellowship took her to the Solomon Islands to collect orchids where a new species she found, Coelogyne susanae, was named after her. 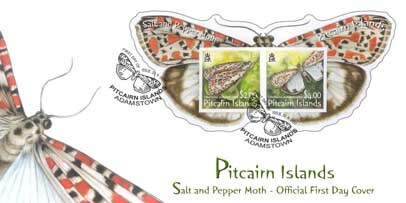 Sue has designed over 50 natural history stamp issues for nine Pacific countries, including New Zealand and she now lives in New Zealand as a freelance artist. 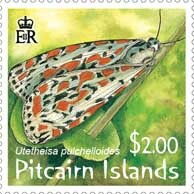 Her last issue for the Pitcairn Islands was Butterflies. Sue recently held a series of successful solo exhibitions in the UK, including Savill Gardens where her work was recognised by Royal patronage. To see Sue’s latest work of originals and the range of cards and limited edition prints available, visit her web site at www.suewickisondesign.com. Format: 2 square stamps plus one die cut miniature sheet with same 2 stamps. Denominations: Stamps $2.00 and $4.00. 22 August 2007 for a period of 2 years.